Check our compatibility guide if you want to know if Acrolinx for Word on Mac works with your local platform and with your Acrolinx platform. 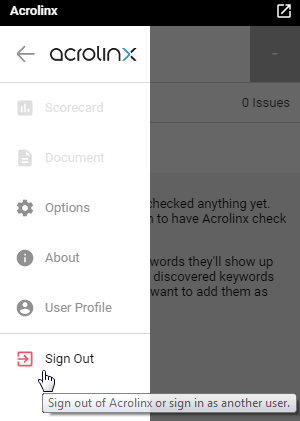 Acrolinx checks saved documents, that's why you can't open the Sidebar if you haven't saved yet. By default, you only need to start Acrolinx once after the installation. After that, Acrolinx should start automatically when you log in to your computer. We regularly release new versions of Acrolinx for Mac. Make sure that you grab the latest version to enjoy new and enhanced features. Before you run the Acrolinx setup file, select Menu bar > Acrolinx > Quit Acrolinx to make sure that you’ve closed the outdated version. Open the Acrolinx DMG file to start the installation process. Sometimes, Acrolinx checks part of your content but can't highlight the issue or automatically insert suggestions. In this case, the Sidebar card appears inactive and shows a padlock icon . You can edit each issue directly in the text. Highlight the content that you want to check. This might be a paragraph or a table. Click CHECK SELECTION - you can find it in the drop-down menu next to the CHECK button. Voila! The Sidebar will only show you cards for issues in the content you've selected. Note: To check a paragraph, you don't need to select the whole paragraph, just highlight a few words in that paragraph or just click in the paragraph. If you want to check text in a table, you can highlight the whole table or select rows, columns, or single cells. To use Acrolinx you need to install VBA on your Mac. You can use your deployment architecture to distribute preferences like the Acrolinx address to your users' computers. This is helpful if you want to avoid issues like mistyped server addresses or simply to speed up the working process. If you’ve set the preferences correctly, you should find the Acrolinx preferences file here.